Today's guest post is from Nicole from Nightly Nails. Enjoy! Hi everyone! I was very honored when Bregje wrote and asked me to participate in her guest post series - and I get a bit of stage fright when I do guest posts, because I adore the people I'm posting for and I think they're so talented. Bregje always has such lovely posts! I had to think a bit about what everyone might like to see, and then I decided I would combine two of my favorite things, green and flakies. So, today I have for you OPI Jade Is The New Black, which came out with the Hong Kong collection. I layered Nubar 2010 over the top of that, and then I used China Glaze Matte Magic. Flakies look especially amazing when you mattify them, I think. It's like opalescent goodness trapped under frosted glass. 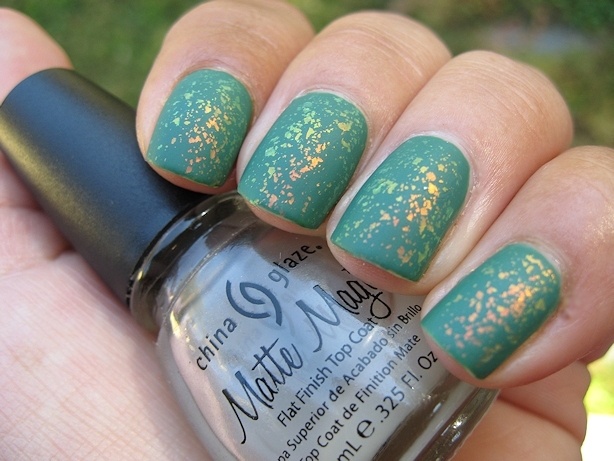 I used two coats of OPI Jade Is The New Black, then one coat each of 2010 and Matte Magic. All of these photos are in natural light. If you've never tried it, flakies also look great over Suzi Says Feng Shui, from the same collection - it's one of my favorite layering combinations! Everyone probably already realizes this, but Nubar 2010 and Sally Hansen Hidden Treasure are basically dupes of each other, so if you don't have 2010 you could use Hidden Treasure for this combo as well, or one of the lovely Nfu Oh flakies. I hope you enjoyed my flakie layering, and huge thank you to Bregje for having me as a guest on her wonderful blog! 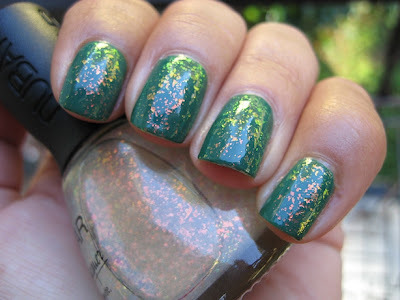 Nicole shows every polish in different angles on her blog and does a great job on capturing colors like that!